The Ruger SP101 might be on the heavy side for a rimfire, but it's a great plinking and small game gun. Ruger's latest introduction is not the first rimfire version of the small-framed SP101. But the first version, which was discontinued in the early part of this century, was doomed from the start. Though it was the right size, the original SP101 was way too heavy for a small-framed .22, and it had a tiny blade rear sight that was adjustable for windage only—not traits consumers seek in a revolver intended as a trail gun or plinker. Fortunately, those faults have been addressed in the latest version. The SP101 22 is a small-frame revolver. It's not quite as tiny as Smith & Wesson's J frame, but it's a nice size for a trail gun. Like all Ruger's revolvers, its frame is made from an investment casting, which results in a frame that is a wee bit on the beefy size, but it's hell-for-stout. The latest version of the stainless steel revolver got a three-ounce weight reduction and a 33 percent firepower increase courtesy of its new eight-shot cylinder. Empty weight is now 30 ounces, and it has a 4.2-inch barrel that is just about perfect for all-around use. The SP101's eight-shot cylinder shaves a few ounces off its weight and significantly increases the revolver's fun factor. The Ruger's eight-shot cylinder locks up front and rear. The cylinder is 1.585 inches long, which is long enough to accept .22 Magnum cartridges should Ruger decide to make that an option down the road. A convertible revolver sounds like a great idea, but it would require Ruger to use the .22 WMR's .224 bore diameter as opposed to the .22 LR's bore diameter of .218 (.22 LR groove and bullet diameter are .222). Because of that difference in bore diameter, accuracy is hit or miss with convertibles. I would prefer to see this one offered in separate .22 LR and .22 WMR versions with the appropriate bore diameters. Excellent adjustable sights are another of the redesigned revolver's significant improvements. The interchangeable front sight is a black, ramped post with a green fiber-optic insert. The rear sight is a simple black blade that is fully adjustable for windage and elevation. The rear notch on my original test gun is V-shaped. That was an obvious mismatch for the gun's square post front sight and its round fiber optic bead. Fortunately, Ruger rectified that on the final production gun with a square rear sight notch. It's a combination that works well for target shooting and small game hunting, from first light to last. The SP101 operates like any other Ruger. It can be fired double- or single-action, and a quick push of the button on the left side of the frame releases the cylinder. The trigger on my test gun is fairly smooth, though the double-action pull is a bit on the heavy side, breaking at a hair over eleven pounds. The single-action pull is a crisp two pounds, one ounce. The author's prototypes had a V-notch rear sight, but current production guns have a square notch—a much better match for the front sight's fiber-optic bead. When I first unboxed the test pistol, I was impressed with its fit and finish as well as its sights and eight-round cylinder. I also liked the feel of the grips, which are made of comfortable black rubber that surrounds the entire grip frame. The grips' checkered, wood inserts feel good and look great against the black rubber. 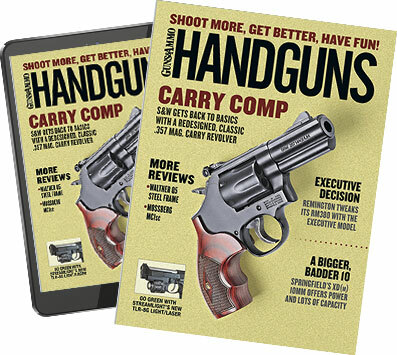 I tested the revolver with five popular .22 LR loads from CCI, Federal and Winchester, and I stuck with the same type of rounds I normally use on the ranch: high-velocity hollowpoints. I shoot a lot of animals with my .22s, so I like the extra lethality those speedy hollowpoints provide. I performed my 25-yard accuracy testing over a sandbag rest. I would normally start with some close-range work to get used to the trigger, but rimfires get dirty quick and I didn't want to skew my results. Besides, the single-action trigger was light and crisp enough that there wasn't much to get used to, so I got right down to business once I verified that the sights were zeroed. In my experience, accuracy testing rimfire revolvers is more of a crap shoot than with any centerfire handguns because of inconsistent rimfire ammo quality and variances in those five, six, seven or, in this case, eight chambers. When you combine all those chambers with mass-produced, bulk pack ammo, it's hard to get the kind of consistency you need to shoot tiny groups. Fortunately, I chose quality ammunition and the test gun is well-made because it shot so well I didn't feel the need to use the same five chambers for my accuracy testing. Their sub-two-inch accuracy put Federal's 40-grain copper-plated solid and Winchester's 40-grain Dynapoint at the top of the accuracy chart. CCI's Velocitor, which is one of my favorite rimfire hunting loads, and Federal's 38-grain hollow-point load also shot fairly well. However, CCI's 36-grain Mini Mag hollowpoint averaged a disappointing 3.1 inches from the sandbag rest. I also experienced the odd flyer with this load that opened up a couple of really good groups. That same Mini Mag load shoots under two inches in my old S&W Kit Gun, which once again proves the point that rimfires are fickle. After I tested the SP101 on the range, I spent the better part of four months packing it around the ranch as I checked my traps, guided hunts and did my chores. In that time, I used it to dispatch countless raccoons and hogs that were caught in my traps and I shot hundreds of rounds through it on my steel target range. Between clients, I also used it on jackrabbit and squirrel safaris. All told, I fired almost 500 of Federal's 38-grain hollowpoint load through that little Ruger without a hiccup. It fired every time I pulled the trigger, and I didn't have a single extraction issue, though I would like to see it get a slightly longer ejector rod. The rimfire's trigger pull also improved a bit over time. It didn't get much lighter, but it was noticeably smoother by the time I completed my evaluation. I also became very fond if the SP101's adjustable sights. They were fine enough that I could hit steel plates with them consistently out to 50 yards, and they allowed me to make consistent head shots on squirrels when I snuck into reasonable range, yet the fiber-optic front sight was big and bright enough that it worked really well on speed drills, too. I'd like to see Ruger offer the same sight combination on more models. If I had to find anything to criticize, it would have to be the .22's weight. Because it is made from a casting, the SP101 line is heavier than competing, forged designs. Its extra weight gives the SP101 the strength to handle the .357 Magnum cartridge, and it helps tame that magnum recoil. That's great if you're SP101 is chambered for .357 Magnum. But rimfires don't recoil, and the extra weight makes the rimfire Ruger a bit heavy, in my opinion, for a backcountry companion. It's a great shooter, but I would love to see Ruger slim it down a bit. If you're in the market for a great plinking or small game piece and you're willing to overlook a few extra ounces, you would be wise to consider the rimfire version of Ruger's SP101. It's a rock-solid revolver that shoots great, and it's priced right. What's not to like about that? Smallest avg. group: Federal 40 gr. copper-plated—1.7 in. Largest avg. group: 36 gr. CCI Mini Mag—3.1 in. Avg. of all ammo tested (5 types)—2.4 in. Notes: Accuracy results are averages of five five-shot groups fired over a sandbag rest from 25 yards.